Developments in the field of Virtual reality technology, low cost VR headsets and increasing sophistication of the mobile handsets, has made access to VR much easier and cheaper as well. The education sector enjoys a close synergy with technology with new and latest technological tools being increasingly adopted to transform how education is imparted in the classrooms and beyond the physical boundaries of the classroom as well. From recorded video tapes to the use of portable tablet with educational content, smart classrooms, AV projectors, as well as the online disbursal of and submission of projects reflects how closely the two have been interlinked. Developments in the field of Virtual reality technology, low cost VR headsets and increasing sophistication of the mobile handsets, has made access to VR much easier and cheaper as well. Virtual reality uses content that is computer generated to simulate images or content in life size and multi-dimensional. VR also allows seemingly real interaction with simulated content through the use of special electronic equipment such as the VR Headsets and sensors embedded in the user’s clothing etc. The interactive and immersive experience accorded by virtual reality technology and the ability of VR to facilitate realistic learning activities has the potential to radically transform the education sector with its increasing adoption. The traditional approach to education hasn’t changed much over the years. Students are expected to learn through assimilation without much scope for an immersive or experiential learning. With Virtual reality, things are going to change in the way education is being imparted. Students can now look forward to learning about the solar system in a three dimensional environment and even physically engage with the planets and moons in a solar system. VR’s ability to introduce practical knowledge to students without having to leave the room is an invaluable contribution to education. Virtual reality also removes barriers associated with transport and logistics in real world and opens up immense opportunities to be explored. Students for instance can go on a field trip to the Amazon rain forest from the comfort of their classroom anywhere in the world. Hitherto near impossible tasks such as a field trip to the moon or the surface of Mars can now be explored from the within the comforts and safety of a classroom. Such a realistic multi-dimensional experience delivers a truly immersive learning experience, making the knowledge gained much more holistic. Virtual reality can also be helpful to those learning a foreign language as it can simulate situations as well as open up possibilities of collaboration with other learners of the language. VR can also aid learners with special needs to focus attention on specific task and problem areas improving their learning capacity. Moreover, VR simulations are ready to lend a hand for study and research of possibly hazardous situations, which might not be possible in real life. Virtual reality is also increasingly being used in the field of higher learning and education. In the field of medical education, for instance, virtual reality is increasingly being used for surgical trainings. VR, while providing realistic experiences to surgeons, is cost effective and helps cut down the time taken by surgeons to be ready for live operations. Traditionally surgeons train on cadavers and start out by helping experienced doctors perform surgeries before they take over smaller tasks and incrementally bigger portions of the surgery. VR has helped surgeons practice complex surgeries without any risks to actual patients. According to Dale’s cone of experience, knowledge retention in learners is highest when they ‘Do’ as opposed to what they hear, read, or observe. Virtual reality enables a constructionist approach to learning where learners can engage with content in an immersive environment. From chemical bond formations to chemical reaction, everything happens right before the eyes of the learners through virtual reality. Educational experience delivered through virtual reality can be entertaining, delightful, and practical all at the same time. 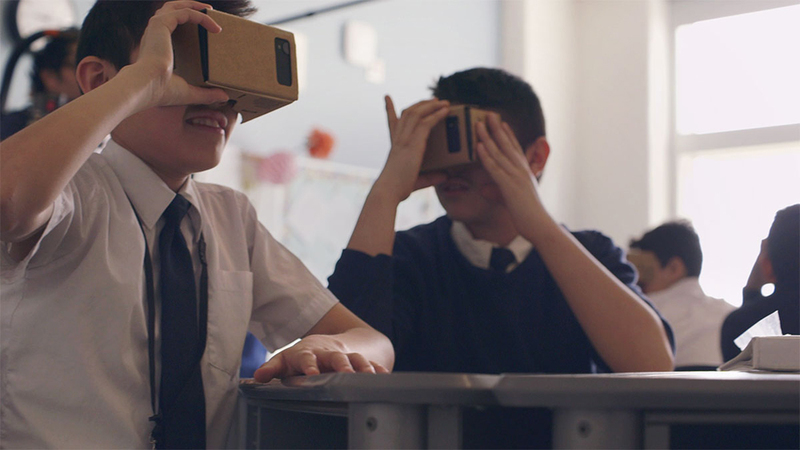 Google Expeditions is one such widely popular virtual reality educational tool that enables students across the globe to experience historical landmarks, explore coral reefs, and even travel to outer space. There is now a host of such proprietary software available now that delivers 360o views of realistic and immersive educative content through virtual reality. For a country like India where education delivery is quite conservative in its overall outlook the potential for VR aids such as Google expeditions and others in the education sector cannot be undermined. We, at MBD Group, are soon going to launch a new line of Virtual Reality based content and device for better understanding of children. MBD’s new high quality, interactive 3D virtual reality simulations will be made available for students from Kindergarten to Grade 12. Additionally, the group also plans to deliver high quality VR content for vocational courses/skill courses in the informal education sector as well. Apart from the Group’s own VR device, MBD’s VR content will be compatible with all other leading VR devices like Samsung Gear, Oculus Rift,etc. for wider accessibility. While the development of virtual reality may still be evolving, the possible application of the technology, especially in the education sector, is endless. From basic concepts of science and mathematics to the most complex of medical surgeries, from a tour of the Martian surface to 3D home designs, virtual reality can help deliver a truly immersive and realistic experience to discerning learners across the globe. While the technology itself is still evolving, educational requirements and challenges also evolve over time. From audio-video rooms in one corner of the school to the smart classrooms of today, education delivery has adopted technology to adapt to changing requirements in the education sector. None, however, were successful in delivering a truly immersive and practical learning experience as virtual reality does. And to note that the era of VR in education is just getting started hints at the exciting times that lay ahead for the education sector. Monica Malhotra Kandhari started her entrepreneurial journey at a very young age. Presently a Managing Director in MBD Group, she learned her ropes in this very outfit at the shop floor. Under her aegis MBD group has ventured globally with the launch of its first publishing branch in South Africa (Cape Town). High pay for quality teachers..